My home hop garden is off and running for the 2018 season! I'm always amazed by how quickly hop bines grow. The top row of the collage below shows how my Chinook plant progressed during the month of March. From left to right, you can see how it has grown. 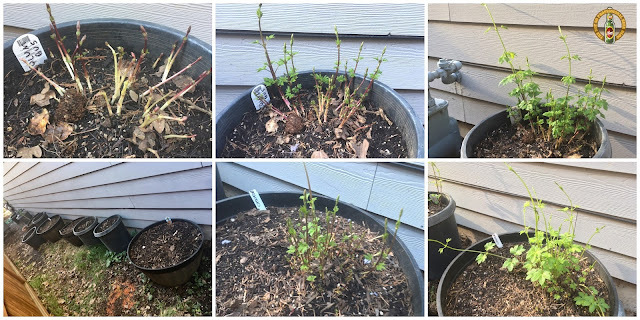 The last two pictures on my the bottom row show one of my Cascade plant's growth during late March. While most of my other varieties are doing well, I was surprised to see the Chinook (my champion of 2017), is off to a slow start this year. Although I'm happy with my results from the 2017 growing season, I did a fair amount of preparation last fall, which will hopefully lead to a better yield this year. 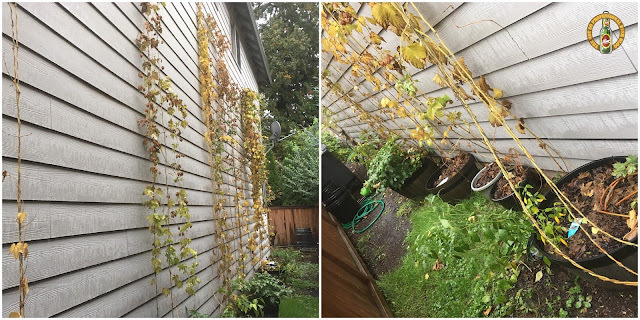 The first thing I did was let the bines dry out before cutting them down last fall. I read that this practice allows the plant to transfer additional energy to the root system. It seemed reasonable to me, so I cut down my bines in late October. As you can see in the picture below, they had turned yellow by that time. The second thing I did was transplant most of my plants into bigger pots. Since I was going through the trouble, I decided to improve the soil at the same time. 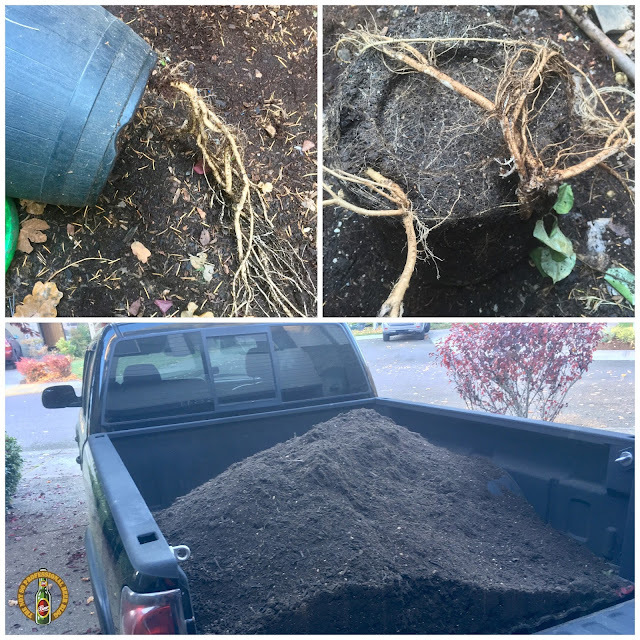 I purchased a yard of Super Grow Topsoil, which is a blend of sandy loam, garden compost, cow manure, mushroom compost, and horticultural pumice (pictured in my truck below). Getting the plants out of their old pots was quite a challenge as the root systems had breached the drainage holes (also pictured below). With the help of tin snips and some careful maneuvering, I managed to get the roots out intact. I've read that during the plant's first year of grown, much of the growth is focused on root development. After transplanting, and seeing the roots, I can attest to this fact. Time will tell if this work was worth the effort. In the meantime, I'm looking forward to another season of hop growing! Top: Root systems of 1st year hop plants.